It's fun to play co-op games together, right? Builds friendships while breaking them down. This is a confusing concept but when you play the following game you'll understand. Missed PART 1? Go check that out! Needless to say we promptly walked in the opposite direction. When I was playing the original, honestly, I never finished it mainly because I got frustrated with solving all the puzzles on my own. It really needed some co-op of some sort, it seemed like a no-brainer really. And so God answered my wishes and we got Trine 2, the perfect co-op platform puzzler. 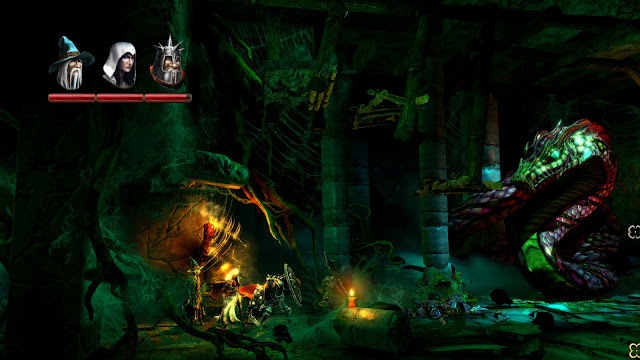 If you're unfamiliar with Trine, it follows the adventure of a Knight, Thief and Wizard. Each of the three has specific skills and a role to play in trying to get further in the game. The Wizard can conjure planks and blocks from thin-air and has the ability to levitate objects - both crucial to conquering puzzles. The Thief has supreme agility and can jump higher and also has a grappling hook which allows her to latch on to wooden platforms. The Knight is the powerhouse, tasked with finding secret areas covered with breakable material or simply defending the other two with sword-and-shield or and warhammer in hand. Honestly you will probably scream at your friends while playing this but that's half the fun, fighting over who should do what, everyone else with the "better idea" of how to conquer the puzzle. Personally, I find stacking wizard boxes and making a totem-pole to solve most of the jumping puzzles! A beautiful looking game but with plenty of puzzles that you will probably struggle to complete, but with some friends behind you it's a piece of cake - right? Moments after seeing this you're likely to be dead. It's become the go-to-game when you think of zombie shooters, sure we have House of the Dead still holding the on-rails zombie shooter but Left 4 Dead presented us with a whole new FPS experience. 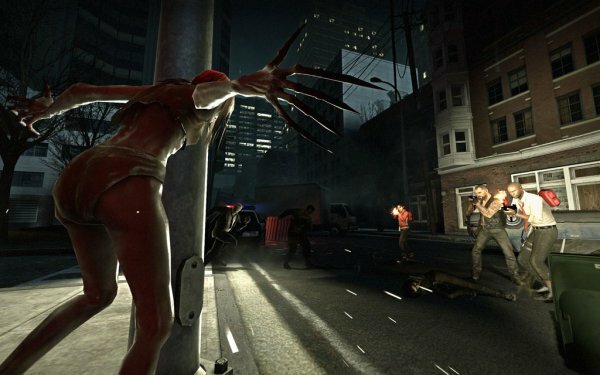 If you're unfamiliar with Left 4 Dead, it focuses on 4 survivors of the zombie apocalypse who have to make it from one area to a 'safe house', while fighting not only hoards of your regular zombies but also specially mutated zombies with special powers to ruin your day. The most terrifying of all, The Witch, sobbing weepy little girl noises haunt you as you walk around her vicinity but then when you make eye contact she runs at you and can down you in one-hit. 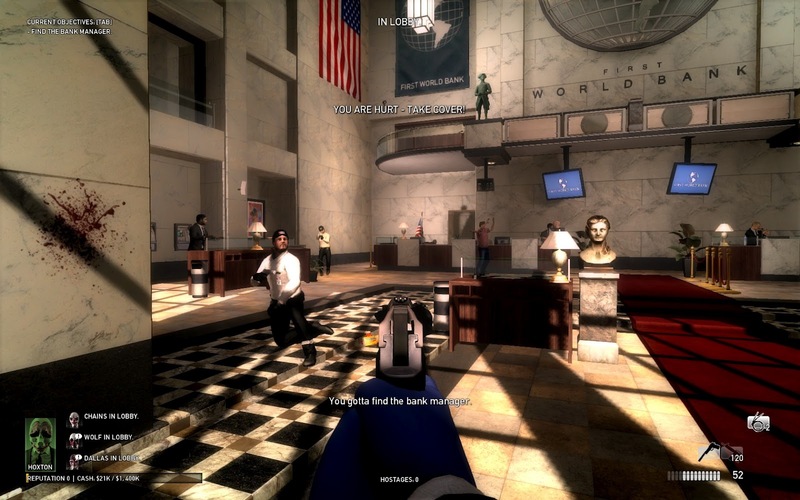 You have many, many guns (then melee weapons in Left 4 Dead 2) at your disposal and a supplies that you have to use sparingly to keep the group alive. The AI is tolerable but I'd wholly recommend a full party of co-op buddies just so you have someone to direct your anger towards have your back. And if you don't like zombies, here is the all-human version. 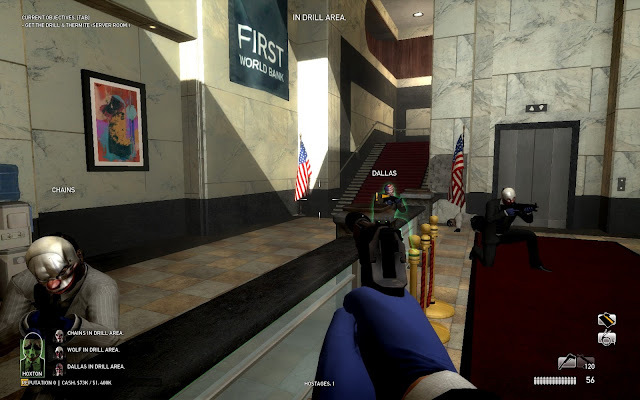 A clever group of mask-wearing fellows engage in a series of missions where you work together as a 4 to complete heists - think Oceans Eleven but with much more violence. Turns out even clowns don't think it's funny to get shot in the face. You work together to complete objectives and keep the authorities from throwing a spanner into the works as you try to get rich in a big way. There's an interesting mechanic where after a player has been downed for a certain time they are taken into custody, to bring this player back into the game the others must restrain a civilian and turn them into a hostage - which effectively converts them into a 1-up/extra life allowing the captured player to come back to play. High difficultly rating for this game, requires good team-work and a lot of patience. You rank up as you play which unlocks better items for your loadout, so you may need to play over and over before you feel your character stands a chance against the heavily armed SWAT forces.